Stand clear of Holland’s horse meat. 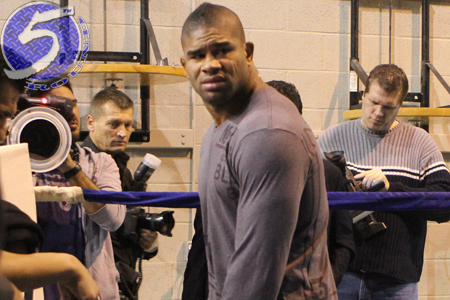 According to Nevada State Athletic Commission executive director Keith Kizer, UFC heavyweight top contender Alistair Overeem (Pictured) registered a Testosterone/Epitestosterone (T/E) ratio of 14:1 in his flunked UFC 146 pre-fight drug exam. Kizer initially announced Wednesday that Overeem had failed his screening when elevated levels of testosterone were discovered in the urinalysis he submitted last week. While he didn’t specify the exact ratio the former Strikeforce champ produced in the surprise test, Kizer did state that his “A” sample registered higher than 10:1. The NSAC allows a T/E ratio of 6:1. The World Anti-Doping Agency permits a 4:1 mark. Just in case you were wondering, the average male produces approximately a 1:1 ratio. “The Demolition Man” must now stand before the commission to explain himself. At that yet-to-be determined time, the 31-year-old can request to have the results from his “B” sample to confirm the original results – if he so chooses. Although Overeem’s physique had become noticeably inflated over the years – which promoted many in the MMA community to wonder if his increased girth was gained naturally, or by the consumption of horse meat as he claimed – he had never failed a drug screening until yesterday. Overeem was slated to challenge champion Junior dos Santos for his freshly-minted crown at UFC 146. However, it’s highly unlikely the NSAC will issue the controversial kickboxer a license given the recent turn of events. No word on who might serve as Overeem’s substitute on May 26th, but former two-time title holder Frank Mir has emerged as the early front-runner.